To assess the phenotypic variation in flower shape occurring in several species of Erysimum, we apply landmark-based geometric morphometrics tools. People interested in a more technical and methodological explanation of geometric morphometrics can visit the Stony Brook Morphometric website. To study of any potential adaptive function of flower shape and the role played by pollinators as selective pressures we have conducted several studies with different Erysimum species, determining the relationships between flower shape and fitness estimates (using as possible accurate and inclusive estimates, rather than the standard incomplete estimates), the effect of major pollinators in these relationships, and the preference pattern and effectiveness of major pollinators. To put together all these pieces of information, we use structural equation modeling with latent variables. 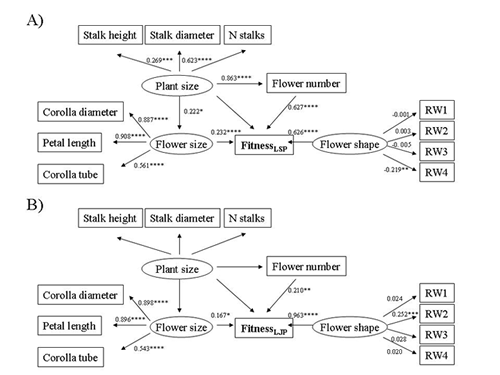 We think that, by applying this advance multivariate technique, we are able to model the effect complex variables, such as flower shape, on plant fitness. To build our models, we usually use SEPATH module in Statistica 7.0 and MPlus.